The holy Grail of electric vehicles, EV is not so much newer technologies, including better battery chemistry but making what works today even better. Of course, this doesn’t mean we should stop working on improving the current technology and dive into better lithium chemistries, but what we have today works and can be improved upon. With that said, Ford’s EV+ does exactly that, squeeze more efficiency out of today’s technology while empowering drivers with flexibility. Ford’s EV+. Imagine you are a mile away from a fast charger in your brand new Fusion Energi, or C-MAX Energi, Ford’s new plug-in hybrids, PEHV. The battery pack is low, but has enough charge to go on. Should the engine come on to recharge the pack and use gasoline in order to save electricity or should the car be smart enough to know it is nearing a charger and that will stop there to recharge? Of course, the second option sounds better and this is exactly what EV+ aims to do. In essence, EV+ uses a GPS tracking system that plots out the nearest chargers, evaluates your current charge state and how long you can drive on electricity. 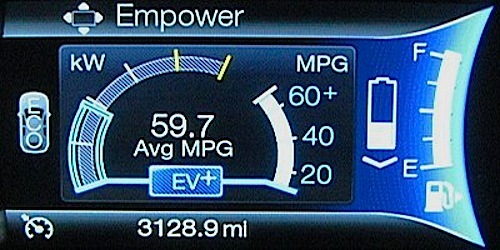 What this means is the EV+ system potentially raises your fuel economy and saves money for your gasoline budget. By squeezing the extra electrons out of your battery pack for the last mile, you are saving the more expansive gasoline in your tank for future use. Optimizing The Electric Drive. EV+ basically optimizes your electric drive on either plug-in hybrids with a program written by two Ford engineers, Ken Frederick et Matt Smith. In fact, according to Kevin Layden, Ford’s Director of Engineering and Electrification Program, Hybrid drivers want to drive on electricity alone as much as possible, especially when they find themselves close to home or near a charger they often stop and park. EV+ blue sign will light up on the dashboard in the fuel efficient display of Ford vehicles indicating a charger is near you. The driver can then choose the electric driving mode only or continue in hybrid mode if they will not stop to recharge at that given spot. EV+ replaces another ambitious project that would necessitate too much data. The original project was to guestimate the distance driven, actual road state and congestion by adjusting the use of gasoline and electricity to maximize fuel economy. Since this would use more data than is currently available, EV+ replaces the previous project with this more hands on approach. Sometimes the easiest and most economical way of helping us save money is simply good old thinking outside the box. By letting drivers decide whether or not they can reach their final destination on electricity alone, or if they will need gasoline is an easy way to empower them and offer flexibility, which translates into better fuel economy. We look forward to testing Ford’s EV+ program on the Ford Fusion Energi and C-MAX Energi. Smart. Wish they had a system like that to help me find a Starbucks and bathroom when I was an on-the-road salesman!